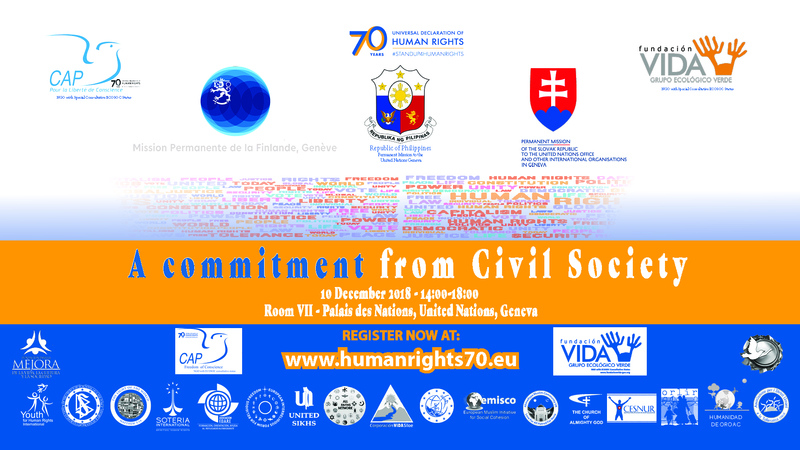 We celebrate the 70th Anniversary of the UDHR and the commitment from Civil Society, in this important moment of history, when challenges of Human Rights keep arising day after day, a key tool for peace keeps being extremely unknown to general population and even civil servants from member states, impeding in this way its logical application even in the daily day life. Our meeting is an open one gathering grass roots movements representatives from Spain, Colombia, Mexico, France, Austria, Holland, Switzerland, Denmark, Belgium, United States of America, Italy and others that all together work in over 195 countries and territories around the world, showing their good practices in making the UDHR broadly known and applied in society, starting from the school, the neighborhoods and public institutions. With this, we want to give each participant a renewed purpose on making the UDHR known and also learning more and different successful ways of making this happen while encouraging a worldwide network that will contribute to ending human trafficking, racism and all sorts of intolerance through the increase of education on the UDHR. We have open the event to public institutions that are willing to inform civil society on the different ways in which they can cooperate together for the noble cause of making Human Rights a closer reality. 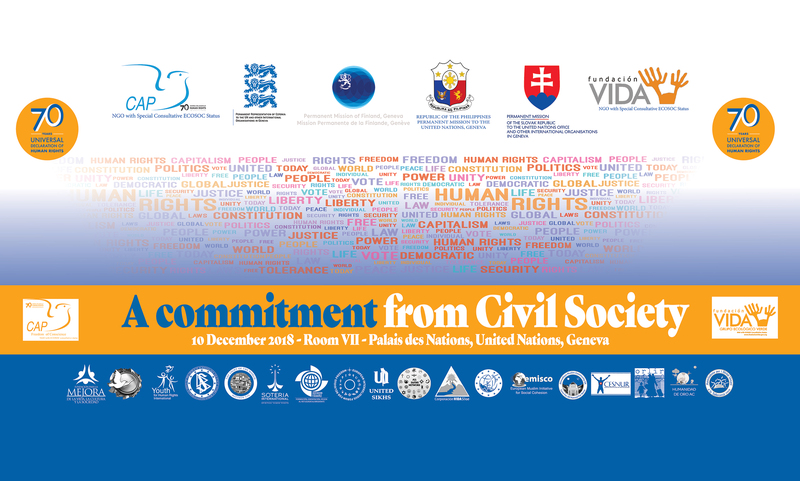 And this is why we want the Opening Session to include high level diplomats and officials to greet the Delegates from across the world and encourage them to continue their advocacy for peace and equality, in order to get closer to a sustainable development of societies for all human beings. (The schedule of the agenda is final so every attendee is kindly advised to enter the U.N premises at least 1 hour before. The agenda estimated and may be subject to changes. To view the most updated version please always come back to this website). Welcome by public officials and institutions. State of Implementation of the UDHR 70 years later. Better knowledge of the Human Rights through Education. How faith based organizations contribute to implement the UDHR. Our MISSION is to contribute to promote the knowledge and application from individual upto supranational level, of the Universal Declaration on Human Rights, and in doing so contribute to the better living of all beings in the world. WE WOULD LOVE YOU TO JOIN US WITH YOUR PROJECTS! 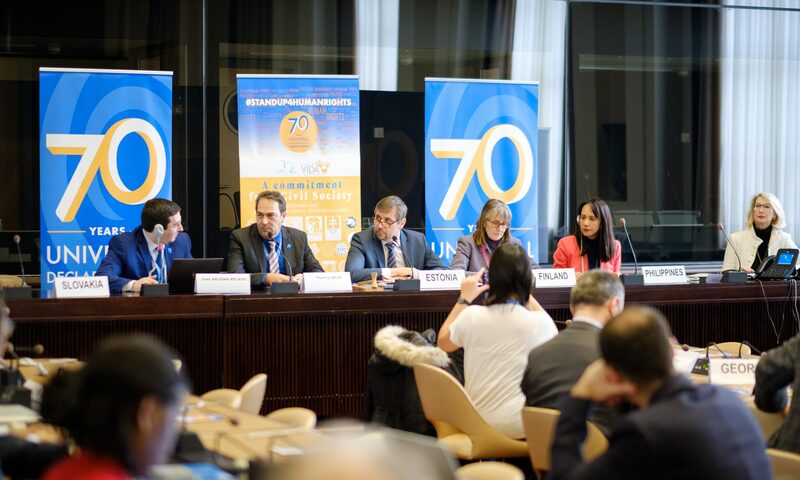 We want to propose you in view of the upcoming 70th anniversary of the Universal Declaration on Human Rigths, to prepare a project, an activity, a video, a conquest, or anything creative but also educational, to promote Human Rights. Your activity will go be presented to our Council and if suitable will promote it in our website. WE ARE WAITING FOR YOU ! ! ! A determined Anna Ganzhul sets out to solve in Mykolaiv, what she believes is the source of all its problems, ignorance of human rights. In 2013, a young Ukrainian woman by the name of Anna Ganzhul, Advisor to the Mayor of Mykolaiv and Chairman of Mykolaiv’s Youth Council, discovered Youth for Human Rights (YHR) at a forum.